Nintendo Land, but for real! With the Wii U still failing to pick up significant momentum, Nintendo has turned to different sources of revenue. First it was Amiibo figurines, then it was smartphone games - now it's roller coasters. The company just announced that it's signed a deal to bring its characters to Universal's theme parks. 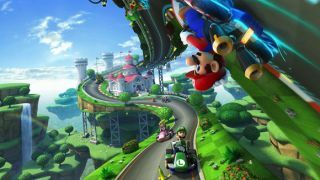 Expect to see Nintendo-themed rides and experiences at some point in the future, though neither Nintendo or Universal have said when it will happen. "Nintendo and Universal Parks & Resorts today announced plans to bring the world of Nintendo to life at Universal theme parks - creation spectacular, dedicated experiences based on Nintendo's wildly popular games, characters and world," reads the press release. Remember the Pinna Park roller coaster in Mario Sunshine? Yeah, we want that. The news comes as Nintendo also announced it had turned its first annual profit in four years. Wii U sales were up 10% over the same quarter a year before, but it's clear that the company needs to do a lot more if it wants to keep moving in the right direction. Nintendo's first mobile game, created from its partnership with DeNA, will arrive later in the year. Before then we have E3, where Nintendo will (hopefully) pull a few surprises out of the bag. With Splatoon on the way, is it time to get yourself a Wii U?